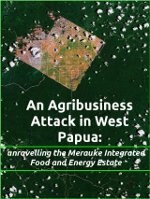 Unravelling the Merauke Integrated Food and Energy Estate. Download the pdf here. This report, prepared in April 2012, gives a full description and analysis of MIFEE and profiles of the companies involved.